By single mums for single mums, facilitated by Aysha, supported by Rochelle Carr, SKIP Coordinator. Do you find it hard to leave the house with your children? 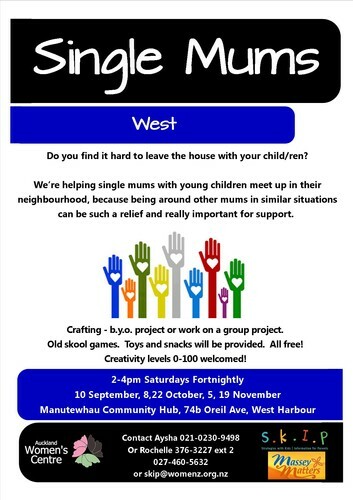 We're helping single mums with young children meet up in West Auckland because being around mums in similar situations can be such a relief and really important for support. The meetups are every two weeks, join in any time. We are going to get crafty. Bring your own craft project or get some inspiration from Aysha on what to do. Old skool games for the children, snacks and hot drinks available. This is part of the SKIP Single Mums' Positive Parenting Project at AWC.